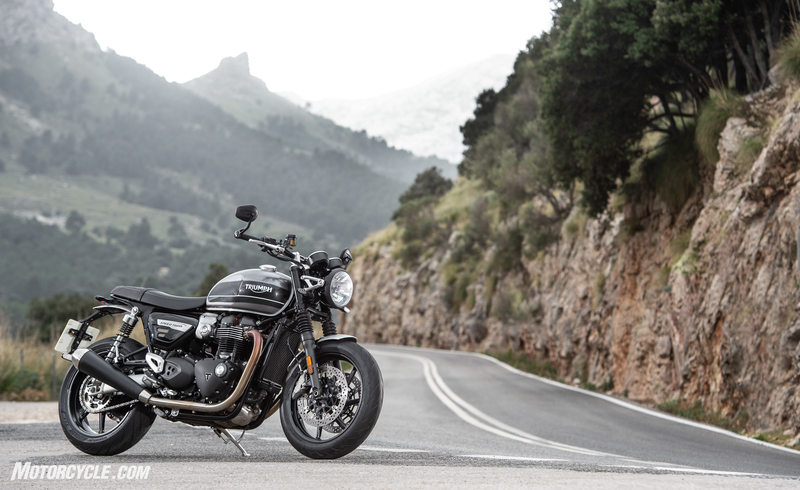 Within Triumph’s Modern Classics line there was always a sizable gap between the Bonneville T120 and the Thruxton. The Bonnie had a nice standard riding position and more sedate power delivery, while the Thruxton had a much more committed rider stance and sportier performance. What about riders who wanted an upright riding stance but craved more get up when the go knob was twisted? Well, the good folks in Hinckley have answered the call with the 2019 Triumph Speed Twin. However, Triumph delivered more than merely a revised riding position grafted onto a Thruxton chassis. Instead, an entirely new motorcycle was created from careful updates to the Thruxton. In the end, the Speed Twin offers a package that may out-Thruxton the Thruxton – at least until some of the Speed Twin’s modifications trickle-up to the older sibling. For starters, Triumph took the 1200cc High Power parallel-Twin engine that powers the Thruxton and set about trimming away the excess fat. While the essential makeup of the engine remains the same, those crafty engineers were able to shave 5.5 lb from the liquid-cooled mill. Weight savings came from many of the usual places for those who follow sporting motorcycle machinery. The cam cover became a magnesium item, while the engine side covers were lightened. That doesn’t mean the engine’s performance was ignored. With the Thruxton R as the basis, the head is a high-compression unit and the pistons in the 97.6 x 80 mm bore and stroke are controlled by a new lighter crankshaft. In fact, minimizing rotating mass, and hence inertia, was a bit of a theme in the Speed Twin’s updates. The clutch assembly is responsible for 2.2 lb of the engine’s weight loss alone. 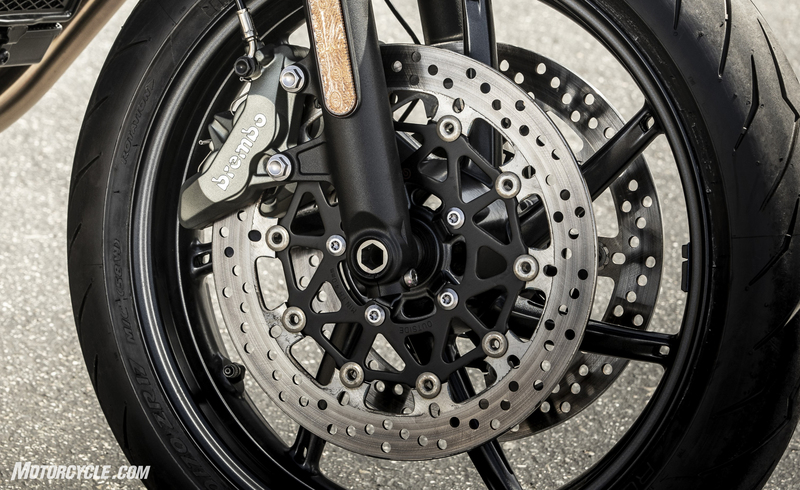 When you consider that the weight is rotating, lessening the clutch’s mass will both allow it to spin up quicker and reduce the effect its inertia has on the motorcycle’s ability to change directions. According to Triumph, that clutch weight decrease delivers a 23% reduction in its inertia. 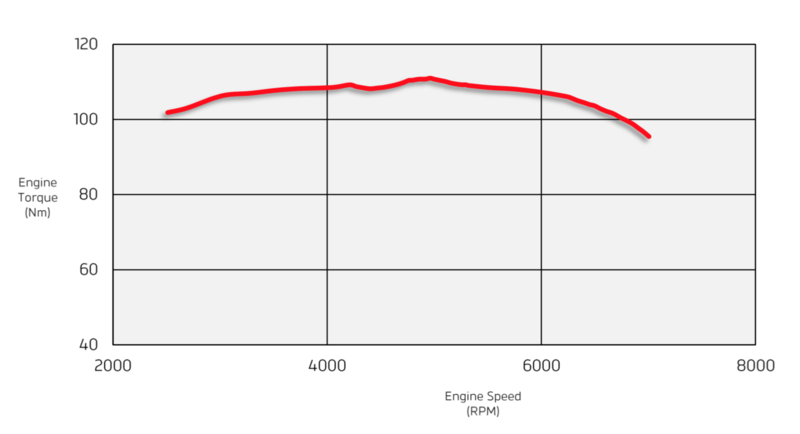 The media kit included this pretty horsepower graph, which felt fairly accurate. All of these changes add up to a claimed 95.7 hp at 6,750 rpm. 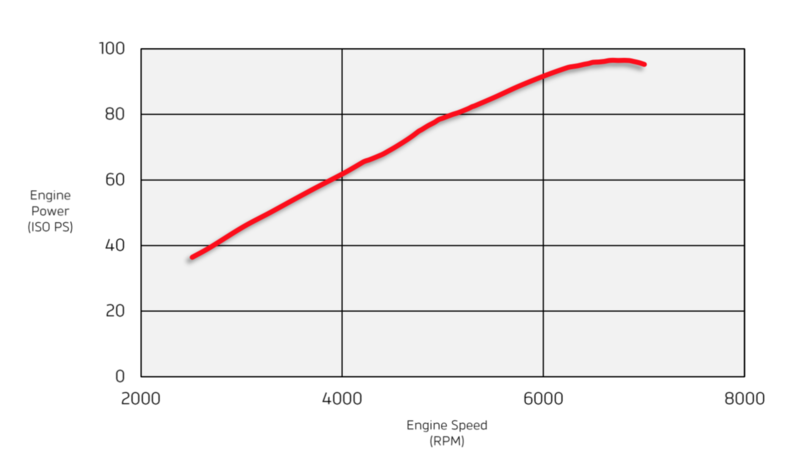 The torque curve is flat, peaking at 82.6 lb-ft at 4,950 rpm. The impressive thing about the torque curve is that it stays above 73.8 lb-ft (100 Nm) from around 2,200 rpm to just shy of the 7,000 rpm rev limit. The result is an engine that is a tremendous pleasure to ride in just about any circumstance. The only fly in the ointment is a tad of off/on-throttle abruptness at low rpm in low gears, which is mostly alleviated by switching to the Road ride mode. Once speeds increase, the Sport mode is essentially seamless in its power delivery no matter what the throttle inputs are. The quickest distance between two corners is a flat torque curve. The rider feels the torque almost immediately, and when negotiating a corner, s/he has the choice of riding the horsepower peak, sporty bike-style, or staying in a higher gear to let the torque curve grunt its way out of the turn. In either event, the acceleration is exciting, and the exhaust note from the dual mufflers is the stuff of moto-dreams. The engine’s character could be summed up with the word smooth. The vibrations from the 270° parallel-Twin are minimal until just before the rev limit. The slick-shifting transmission is a pleasure to operate, and the slip-assist clutch makes for easy modulation in around town traffic and protects the rider from ham-fisted downshifts. As said before, reducing the rotating mass was one of the development themes on the Speed Twin, and there’s no better place to apply this effort than to the wheels. The front wheel and disc assembly lost 6.4 lb, which Triumph claims lessens its inertia by 28%. The rear wheel lost 3.7 lb, but this accounts for a surprising 43% reduction in inertia. The seemingly inconsistent percentages above come from the fact that the front wheel lost weight closer to the hub, reducing the inertial effect the weight would have, while the rear wheel’s weight reduction came from the outside of the rim, causing a greater reduction in inertia. The seven-spoke wheels and the dual discs are significantly lighter than those on the Thruxton. 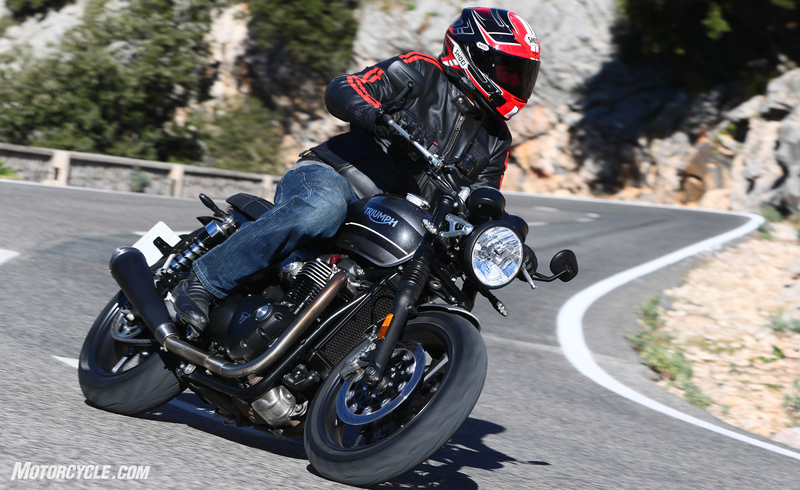 So, is the Speed Twin’s steering quicker than the Thruxton it is largely based on? Since I’ve never ridden the Thruxton, I can only give a qualified yes. According to the other journalists who had spent time on the Thruxton, the Speed Twin’s steering is quicker. My experience with the Speed Twin’s handling was extremely positive. Steering is responsive, not hyperbike snappy, but quick enough to do what I wanted when I wanted. While I’m sure the lessened inertia the bike’s developers were so focused on helped, I also credit some of the quick steering to the 160 series of the rear tire. Speaking of tires, the Pirelli Diablo Rosso III buns were initially a topic of much discussion on the press ride. Of course, leaving the hotel in 49° weather and immediately venturing on a damp winding two-lane road was not the ideal way to warm up the tires, causing a couple of moments. Later in the day, once the temperatures rose enough to dry the pavement, the Rosso IIIs worked well and should be a good tire for balancing performance and tread wear. They may not be radial mount calipers, but these four-pot Brembos still have the goods. The last of the rotating parts is the Brembo brakes. The axial-mount, four-piston calipers squeeze 305 mm floating discs and offer a progressive initial bite and plenty of feel. When the Speed Twin needs to be hauled down to a stop, the binders do it. So far, there haven’t been any obvious cost-saving features on the Speed Twin, but the non-adjustable 41mm standard fork and the preload-adjustable twin shocks would appear to fall into this category. That’s the bad news. The good news is that, if you fit the suspension’s parameters, you’ll be quite happy with how it performs. When wearing my riding gear, I weigh a bit over 200 lb in my improved, post-Christmas holidays form. The suspension worked quite well for me, keeping the chassis stable over all but the roughest pavement at a fairly elevated pace. Non-adjustable suspension still works well – even at an elevated pace – when the settings are well sorted. 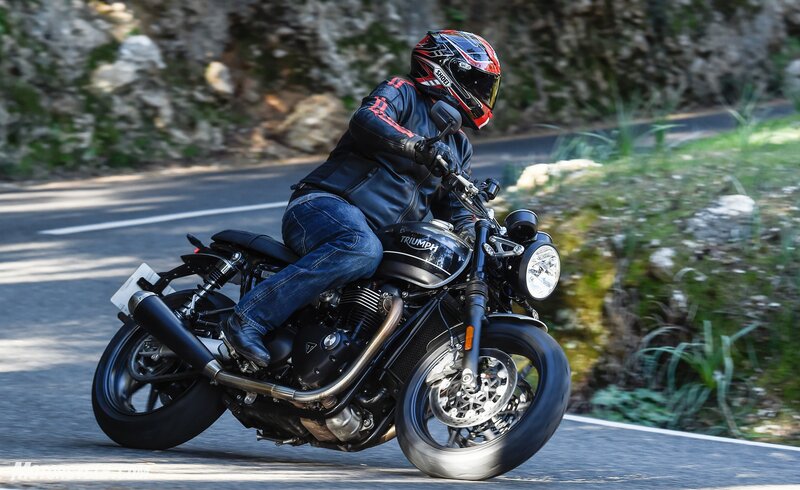 Although Triumph claims the frame connecting the two ends of the suspension is new, it is really a mild update to the Thruxton. When it comes to steering geometry, the rake gets bumped 0.1° to 22.8° – an amount that, for most of us, is the very definition of imperceptible. The trail is also slightly longer at 3.7 inches. Perhaps the biggest news in the frame is the use of weight-saving aluminum down-tubes to cradle the engine. 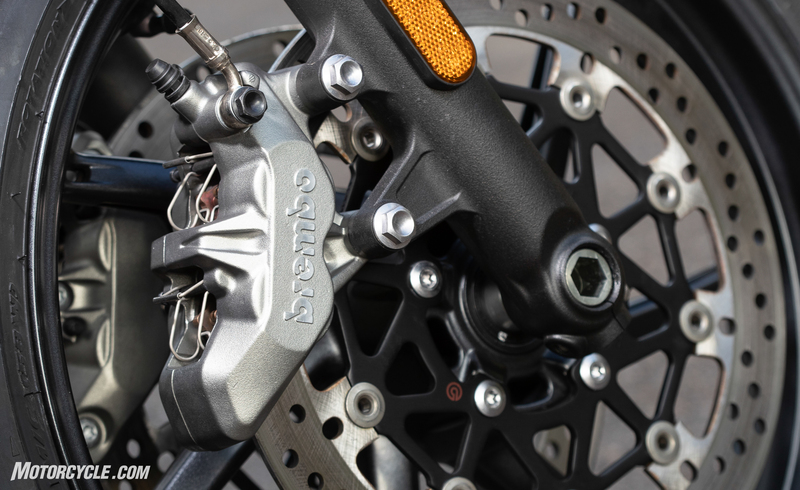 The swingarm is lifted from the Thruxton, making the 15mm increase in the Speed Twin’s wheelbase the result of an additional link in the chain. The riding position works well from 180° first gear corners (like this one) to high-speed freeway jaunts. My 32-inch inseam didn’t feel overly cramped on this all-day ride. 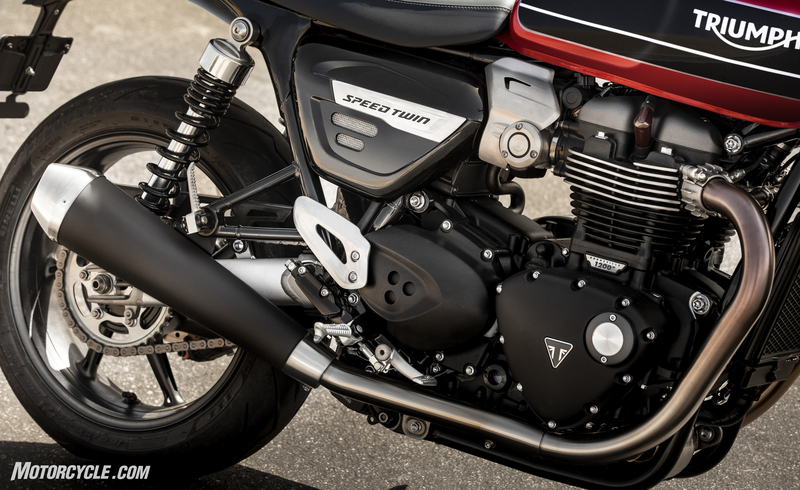 With the performance-focused updates out of the way, let’s take a look at rider comfort.Replacing the Thruxton’s clip-ons with a Speed Triple-derived, tapered aluminum handlebar, puts the rider’s upper body in a nicely upright position with a comfortable reach to the grips. Whether navigating city traffic, cruising on the highway, or bombing along mountain roads, the rider’s torso has enough forward lean to counteract the unmolested wind blast. The new location of the foot pegs also has comfort in mind. Even with the pegs shifted 38mm forward and 4mm lower, the rider’s legs are still folded up a bit. However, the new peg location doesn’t affect ground clearance at street-reasonable speeds. In fact, I didn’t touch a feeler in the entire ride. Still, the improved peg location goes a long way towards lengthening the time the rider can sit in the saddle. While we’re on the subject of the saddle, it was updated with 10mm more padding than the Thruxton’s. Although some of the journos complained about the seat getting tiresome after an hour or so, I had no problems during our full day of riding. Still, those of tender tush have been warned. Retro looks with modern tech. Being a ride-by-wire motorcycle, the Speed Twin features three ride modes (Rain, Road, and Sport). With the exception of low-speed, around-town riding, I kept the mode set to Sport. In town, Road helped to soften the low-speed throttle abruptness I mentioned earlier in the test. Changing modes is as simple as pressing the dedicated button on the left switch gear. Traction control can be set to Off, but any other adjustment is left to those programmed into the ride modes. Naturally, like any motorcycle sold in Europe, the Speed Twin comes with ABS. For those who are interested, the ABS cannot be disengaged. 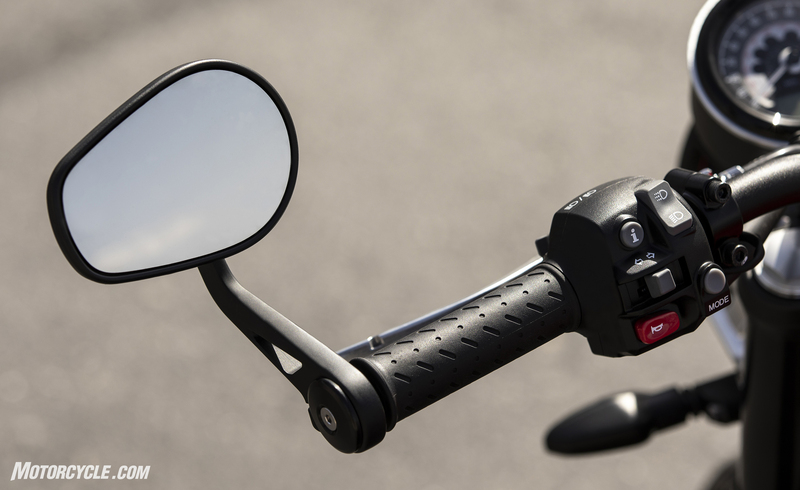 A functional mirror on one end of the grip and a ride mode adjustment button on the other. 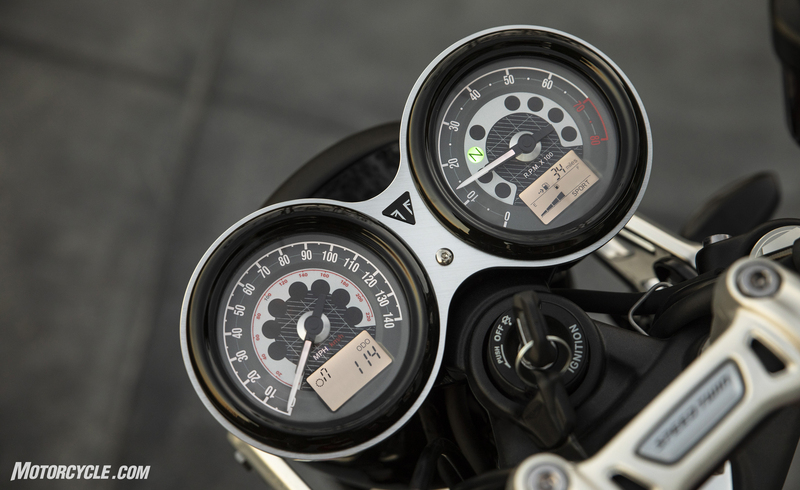 While the twin-dial instrumentation has a decidedly retro look, it has modern tech in the LCD panel of each gauge. Perhaps the most important informational readout is the miles-to-empty display. Unfortunately, the tank is just 3.8 gallons, making the calculated range (based on a claimed 49 mpg) 186 miles. With the way that we rode on the introduction, the fuel light came on well short of 150 miles. So, this is somewhat of a disappointment. Regular MO readers know that Burns would bemoan the ugly tank seam on the Speed Twin, but it is the only true miscue on the entire motorcycle. OK, so the twin shocks would fit the muscular styling a tad better if they had remote reservoirs hanging off the back. Otherwise, the Speed Twin is a tour de force of clean styling and well-executed fit-and-finish. From the elegant lines of the headlight mounting brackets to the finish on the engine to the light, seven-spoke wheels, the attention to detail is wonderful. I even like the bar-end mirrors for their functionality – and style – but I know that living with them in the SoCal land of lane sharing might get tiresome because their location looks to exactly match the mirror height of passenger cars. If ever there were a first world problem, this is one. When a motorcycle’s fit-and-finish is this polished, a tank seam stands out. By aiming the Speed Twin at the space between the T120 and the Thruxton, Triumph filled a natural gap in its model line – and naming structure. 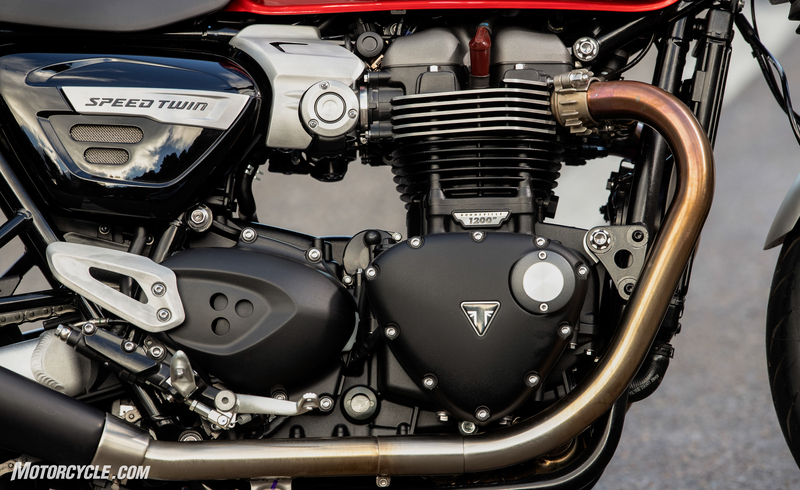 Since the Thruxton served as the basis for the Twin, the T120 would never be able to compare, performance-wise. However, the more everyday focus of the T120’s riding position makes the transition to the Speed Twin easily, producing what may be a Goldilocks motorcycle – performance and comfort wrapped in a Triumph Modern Classic package. While I can only assume this was the intention of Hinckley’s designers, the performance upgrades to the engine and chassis may have created a bike, in the Speed Twin, that upstages the more performance-oriented Thruxton. For now, at least. 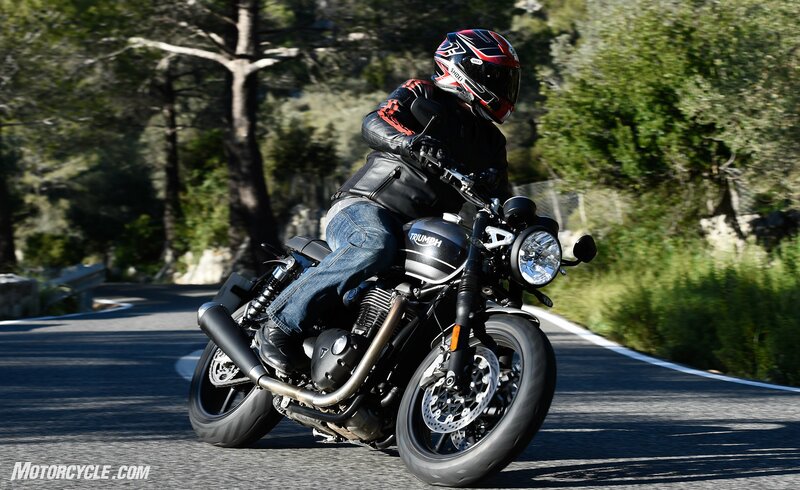 I’d expect to see the Thruxton updated with these improvements – and possibly more – before too long. For those who find the 2019 Triumph Speed Twin enticing, be of good cheer. It will appear in U.S. dealerships in mid-March for a base price of $12,100. If you want one of the two-tone colors other than the Jet Black, you’ll pay just $500 more. To my eye, the Silver Ice/Storm Grey and Korosi Red/Storm Grey are worth the extra money.